UConn newly-hired running backs coach Kermit Buggs knew a thing or two about Huskies' returning running backs Lyle McCombs and Max DeLorenzo during his days at Penn State. Now he is anxious to see how he can get the best out of their abilities for the Huskies' new offensive coordinator T.J. Weist. "I got a chance to sit down with Lyle yesterday and Max came in today," Buggs said on a Wednesday afternoon conference call. "They are willing to work, they want to go after it so I am excited about both of those young guys. I recruited Max when I was at Penn State. I didn't do much with Lyle when he was (in Staten Island) but I knew of him. It is an excellent opportunity for me to get a chance to coach those guys. Buggs never visited DeLorenzo up in Connecticut during the recruiting process but did have an appreciation for the way DeLorenzo ran when he was at Berlin High. "Just at the school and checking in on him," Buggs said. "He was a productive runner, he ran for a lot of yards up there and he was tough so those were some of the attributes I liked about him in high school. Unfortunately, our running backs coach at the time Galen Hall went in another direction so Max wasn't a fit for us up at Penn State but from what he has done and what I hear about his work ethic around year, I guess he could be a great fit here." McCombs led UConn in rushingwith 860 yards. Quarterback Scott McCummings (132) and DeLorenzo (119) were the only other players with more than 100 rushing yards so Buggs will have a chance to work with players who have seen time in the backfield. "I haven't gotten much into the style of each kid yet but hopefully they will all be productive," Buggs said. "We want to make sure they make the first tackler miss, we also want to make sure they can protect the football, catch the football and protect the passer. Basically my style is making sure we have the most well-rounded backs in the country." 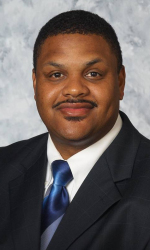 Buggs worked at Penn State from 2003-11, the last four as an assistant coach. He coached the safeties from 2007-10 and all of the Nittany Lions' defensive backs in 2011. However. he was not retained by new Penn State coach Bill O'Brien so he spent last season as the defensive coordinator at Lock Haven. "Coach O'Brien came in, I had a chance to interview with him and he wanted to go in a different direction," Buggs said. "It gave me a chance to be a coordinator again and be in charge of things and get that experience on the defensive side of the ball." However, Buggs played quarterback at Norfolk State and helped coach running backs as a graduate assistant at Penn State and he considers himself an offensive coach. "I coached offense pretty much all my life so my switch to defense was something new for me so it is like coming back home for me," Buggs said. He also will be UConn's special teams coordinator. While UConn does lose record-breaking return man Nick Williams, both kicker Chad Christen and punter Cole Wagner return. guys consistent with what they are doing and in the return game, it is going to be a wide-open race. Whoever comes out and is the most productive first and foremost catching the football and being productive afterwards will be able to win the return job. I don't know how many guys they have on the team right now that can do those things but we will definitely find out in the spring."